Historic aircraft fans are being given the chance to bid on a prize to take control of a Lancaster bomber on a taxi run. Avro Lancaster NX611 "Just Jane" is based at the Lincolnshire Aviation Heritage Centre at East Kirby airfield. The centre is run by the Panton family who are restoring the aircraft as a tribute to family member Christopher Panton, who died over Germany in 1944. The family is offering the prize to raise money for its restoration. 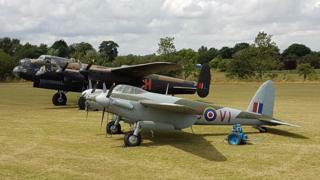 Also on offer is the chance to take a ride in a restored De Havilland Mosquito. The two experiences will go under the hammer on 22 September at the centre with Golding, Young & Mawer Auctioneers. Museum director Andrew Panton, the great nephew of Christopher, said: "There is nowhere else in Europe that these experiences can be taken, so this really is a once in a lifetime opportunity." The Lancaster has already had a a £20,000 repaint as part of plans to return it to the sky. The total cost is estimated to be about £3m, which is being raised by donations and income generated from visitors to the aviation centre. Mr Panton said funds from the auction, which coincides with the centre's 30th anniversary, would also go towards it. Lancaster NX611 was built in 1945 and saw service with the French navy. It eventually wound up as a gate guard outside RAF Scampton near Lincoln before being bought by the Panton family in 1983. There are currently only two airworthy Lancaster bombers in the world, one in Canada, the other in Lincolnshire.